A Warning about buying Japanese swords and Fittings on Ebay. There are now a huge amount of swords claiming to be genuine Japanese swords available on Ebay, Yahoo Japan and other online auction sites for sale that are sadly not even close to the real thing. Most of these swords are being sold out of China however there are more and more sellers popping up in Canada, the US, Australia and the UK so you must beware. These swords are being produced on Mainland China and have little or no character, absolutely no quaity, look for all the world the they were made with an Angle Grinder and are produced for about US$10.00 in total for labor and parts. These swords all have tell tale signs that give away to the careful buyer, clear indications that they are fake. Take a good look at the pictures below, these are typical of the rubbish coming out of China that is being sold as genuine Japanese Antique Swords. 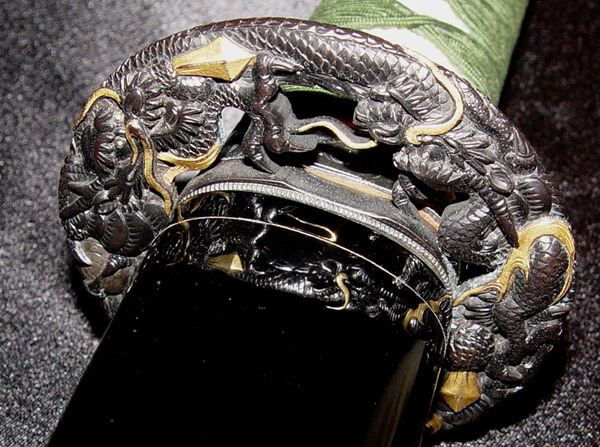 For the new collector who is unsure and can't see what is wrong and what is right, then visit some of our contributors links and take a long look at the swords they sell and try and see their quality, then take another look at the Hong Kong swords, there is a world of difference between them. Auctions coming out of China, about 99.9% would be fake, I have seen one real sword sold out of China in the past 4 years. Private Auctions, some sellers have many friends that bid their swords up for them and it also prevents bidders being warned of fraudulent sellers by genuine collectors. There is another side to this coin though. Private auctions can help protect bidders. I and many others have been contacted by email by fraudulent sellers who collect our addresses from open auctions and silicit us through out email. You need to make your own mind ub about this. Poor Quality, Just take a look at the swords on the Nihonto Links page above to see genuine Nihonto. Over Priced Shipping. One of the latest tricks is to sell swords at auction starting at just $1.00 or even 1 Cent. If however you read below you will see the shipping is generally US$75.00 or even higher. Legitimate shipping prices should be no higher than US$35 to North America, AU$40.00 to Australia and £20 for the UK unless you arrange and pay for premium shipping and insurance. If you have $200 - $300 to spend on your first sword then STOP. Go spend it on some good books instead, seriously. Read and learn as much as possible before parting with your hard earned cash, STUDY STUDY STUDY. I cannot emphasis this point enough. Then, maybe in another 6 months or so, after you have saved up a bit, buy something decent, ask for help, join a club and do as much as possible to ensure you buy a good, genuine Japanese Sword the first time round. You wont regret it, I guarantee it. Here is a list of Recommended books for the beginner and intermediate collector. Here is a list of words commonly used to describe fake swords coming out of China. If these words are in the titles, then beware. Also note the China fakes tend to have numbers at the ends of their titles for some reason. Anicent, Rare, Rosewood, Antique, Exquisite, Stunning, Cowskin, Warrior, Wonderful, Emporer, Museum, Leather, Sharkshin and more. 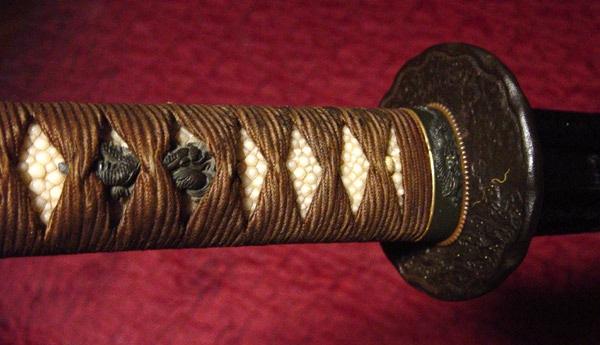 A Helpful Note: When searching Ebay, you can put a minus symbol ( - ) in front of a search name to remove that word from your search, such as Japanese Sword -Rosewood. That way, anything with the word Rosewood in a Japanese Sword search will be left out. These are actual examples of Ebay auction titles and give away the lack of knowledge these thieves have about genuine Nihonto. Remember, if it looks cheap and it is cheap, then stay well clear. If your unsure, then ask, it wont hurt and it is free. 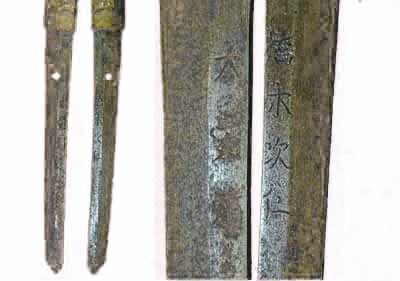 These images will offer I hope, some help in identifying Fake Japanese Swords. Look at the difference between the rubbish from China and the genuine Japanese swords and fittings pictured below. True quality is really pretty easy to spot. Just take your time and look carefully. These are ground into the sword, or acid etched or a combination of both. The one below is acid etched. Clearly the work of a master craftsman. 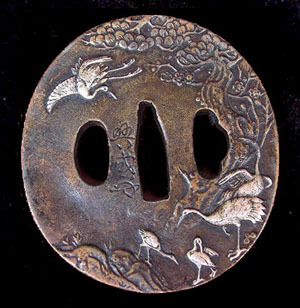 Detailed Nioi, Nie, Hataraki and a beauty that is never found in the Chinese fakes. This is a tell-tale sign of a fake, big, messy swirls that are a confusion of Damascus and Japanese steel grain that looks nothing like either. Finely worked steel. Beautiful workmanship and expertly crafted. No clear Yokote, poor shape and no Boshi. This first one is very ugly. 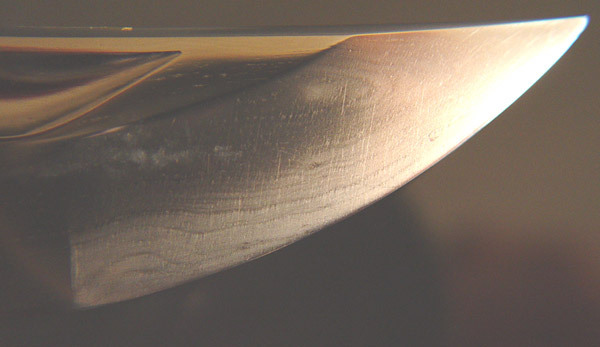 Clean well forged sword with clear well defined yokote, beautiful boshi and as clear and as well defined as the rest of the sword. Again another clear clue as to a fake. New rust, poorly cut signatures that are written in Chinese and make no sense, no file marks and very bad shape tells us that this is very recently made and not at all old. Obviously well forged steel, clean file marks on the surface of the nakago though these are not always there or can be faint with age. Mei or signatures that actually say something. Many of these chinese fakes have Chinese writing and the mei usually translate to rubbish. If genuine signatures are copied, they are always obviously gimei or forged. Genuine age is hard to fake. 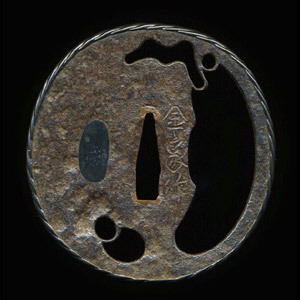 The first 3 nakago are from approximately 1670, 1620 and 1510 respectively. Faking this kind of old rust and age is almost impossible. 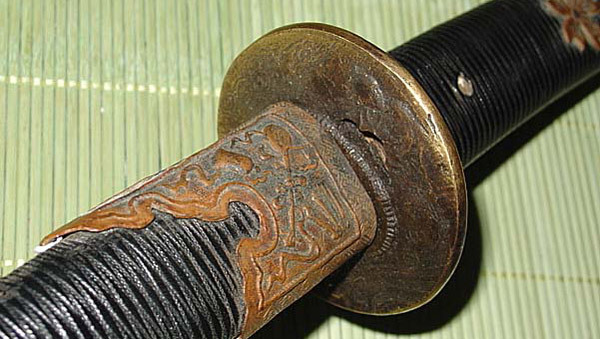 Nakago are most important in sword kantei and are one of the clearest indications of a swords age as well as offering much evidence in the swords origins. 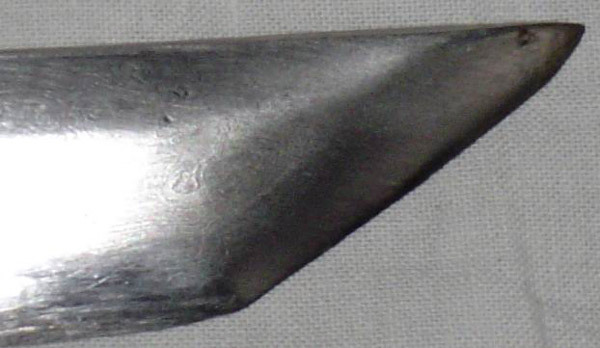 This Shinshint� nakago shows clear Yasurime or file marks. These are just plain nasty, I know 4 year olds that could draw better than this. These images tell the whole story. Expert carving, crisp clear lines. 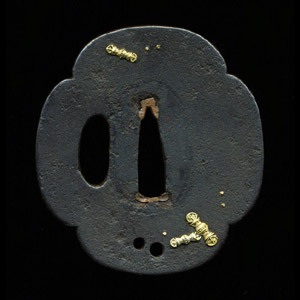 These Tsuba show very poor workmanship,are cast brass and they have poor detail. The mei or signature on the one on the right is very poorly cast and not carved like it should be by an expert hand. The one on the left however may fool a novice collector. Closer study will reveal what it truly is. 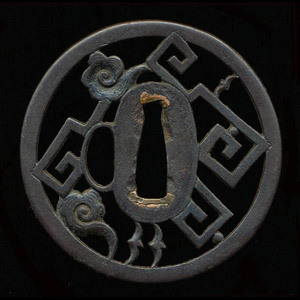 Again, visit the contributors links for images of high quality tsuba. This I am sorry to say was my first Ebay purchase. Copper, black paint and some very poor carving. That was US$70.00 that would have been better spent on a couple of books. This one is very hard to tell. 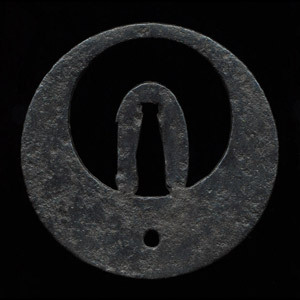 Whilst not a modern fake, it is a cast reproduction of a classic Akasaka tsuba. It was probably made in the late 1800's or early 1900's though possibly a bit later, and the casting is better than most seen it is still a copy. This is were the line stars to blur and collecting becomes more difficult. 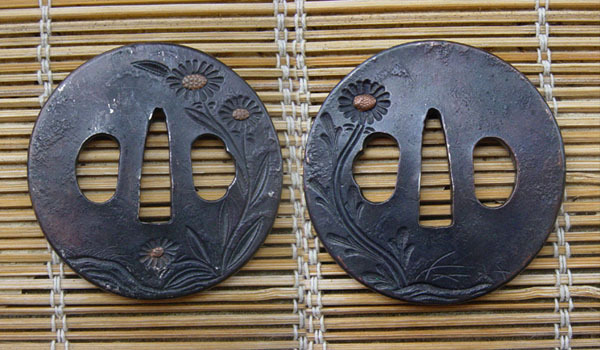 These Tsuba show the quality typically expected to be seen in good tsuba. 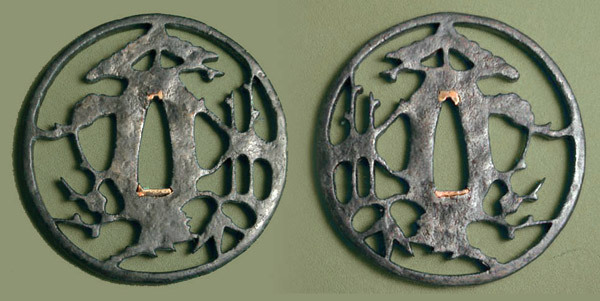 Iron with the use of soft precious metals. Well carved, properly signed. 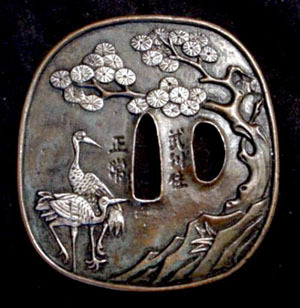 Again, Look for quality and again, visit the contributors links for more images of high quality tsuba. Cheap looking wood, bad paint, gaudy paintings of birds or gods, these are just a few of the usual signs of a poor fake. It gets easier to spot them if you just take the time to look. Notice the paint brush stokes in the lacquer, you'll never see this on a real Saya. Note also the strange blue mess that represents who knows what. Maybe it's lacquered blueberry ice cream. The quality of these pieces tell the full story. This is the sort of Kodogu we should all aspire to collect. Always look for quality first, as in every thing we spend our hard earned dollars on. Poorly wrapped Tsuka, the Ito or cord looks cheap and poorly done. Good Quality Tsuka, Professionally wrapped, High quality Same and fittings. Copyright 2004. Nihonto Message Board.